Today, during a little free-time before the end of the day, a student asked if he could play on the computer, and I consented. A couple of minutes later, he still wasn't on the webpage he wanted. "Mrs.4444," he asked. "How do you spell beeummex?" "'Beeummex. How do you spell it?" Have a great and restful evening sweetie!!! Funny! I remember how amused my kids were as preschoolers when I asked them how to spell VCR and TV. Similar story--hubby was working EMS before he went in the Army. His crew called in take-out one night to a well known local joint. They asked who the order was for, and they said "EMS". "Yes, but how you spell that?" "E M S". This went back and forth a bit until the frustrated Medic said "You know, the man with the ambulance??". They picked up their order a bit later to find "Ammalance Man" written on the box. Too funny...nice chuckle for the end of the day! PS, I gave you some well deserved credit in my last blog. HAHAHAHAHAHAHA!!! Oh, I sorely needed that laugh!! Too hilarious! Of course...if he doesn't wear the helmet it might knock some sense into him? Maybe? f the children are our future, I'm scared. hahahahaha! Omg.....thanks for my first morning laugh! Thank goodness he's in school. It's where he needs to remain. yes job security for you but I wonder about his chances. Interesting that we all forget what the initials stand for once the acronym becomes widely used. RADAR, PET scan, ATM, scuba, etc. 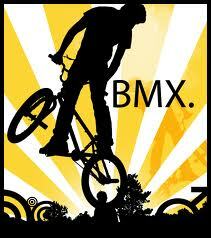 Bicycle MotoCross - Cross is often just given an X.
I read it to Mr. Ski who also got a laugh! It reminds me when my nephew tried to convince me that Back in Black was a new song from this hip new band called AC/DC! Love his heart! today during free play Frank went on KidPix and recorded a song he made up called "The Naked Song." He was in a time out for about 20 minutes. He's why I had two cocktails tonight.